As the popular saying goes, “When life gives you lemons, make lemonade.” But when it comes to the real benefits of lemons in our lives, that cool refreshing beverage sipped on hot summer days is just the tip of the ice cube. 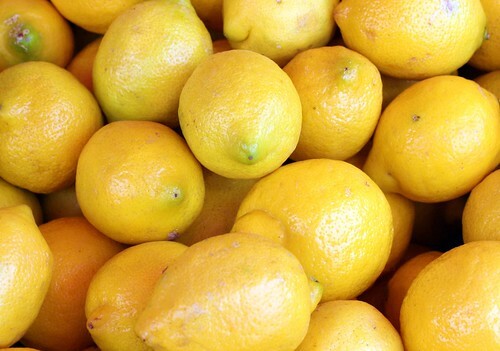 Here’s a look at 7 healthy ways lemons come to our aid every day. One of the key culprits that contribute to the aging process are free radicals which can hasten oxidative processes in our bodies that weaken our immune systems and damage healthy cells. Lemons contain high levels of Vitamin C, a powerful antioxidant that can help neutralize and reduce the damaging effects of free radicals. The benefits of Vitamin C on the skin are increased levels of collagen which promotes elasticity, the repair of damaged tissue, and the possible prevention of wrinkles. Studies published in the American Journal of Clinical Nutrition have shown that women who take higher levels of vitamin C are less prone to wrinkles and dry skin. Although more studies are needed to connect lemons with cancer prevention, there is strong evidence that natural compounds found in lemons called limonin and D-limonene—may play an important role. D-Limonene has been shown to inhibit certain abnormal cell divisions that may lead to cancer. In addition, limonin has been shown to increase levels of certain liver enzymes that are thought to play a role in the removal of cancerous chemicals from the body. Being that limonin and D-limonene are found in the lemon rind, a good source of concentrated amounts of these compounds is lemon essential oil. You wouldn’t know it by the sour, acidic taste, but lemon juice is a natural buffer which, when diluted in warm water can alleviate heartburn, nausea, bloating and indigestion. Lemon water has also been shown to stimulate appetite, improve regularity and aid in detoxifying the gastrointestinal system. With its natural antibacterial properties, lemon juice can be used as a natural antiseptic for treating minor wounds and infections, especially canker sores and other lesions in the mouth and throat. Diluted lemon juice can be applied directly to the involved areas with a cotton swab, or a warm lemon water gargle may be used, especially for treating sore throats and laryngitis. Vaporized lemon essential oil has also been shown to kill airborne pathogens that can cause a number of diseases, making it ideal for use in hospitals rooms, classrooms and waiting rooms. For those who are dealing with high blood pressure, research suggests that lemons, or more specifically the vitamin C they contain, can help to lower and stabilize blood pressure. A study published in the Dec.1999 issue of the medical journal ‘Lancet’, showed that patients who took 500mg of vitamin C per day experienced significant lowering of blood pressure compared with those patients who did not take daily vitamin C. The reason given is that vitamin C’s antioxidant properties help the body maintain adequate levels of Nitric Oxide, a compound shown to help regulate blood pressure through the relaxation and dilation of blood vessels. Lemons also contain fairly high levels of potassium, which helps keep blood pressure under control by blunting the effects of sodium. Excess dietary sodium intake causes fluid retention which increases blood volume and puts more strain on the heart to pump it through the blood vessels. Although the aroma of lemon is often associated with freshness, sunshine, and that drink in the tall cold glass, aromatherapy with lemon essential oil has also been shown to stimulate the mind and lift the mood. And since depression is also associated with anxiety, essential lemon oil—used alone or blended with other aromatic oils such as Lavender and Roman Chamomile—can reduce anxiety and mental fatigue while promoting relaxation. Stress, improper diet, and other factors can produce a condition called systemic acidosis, a high acid content in fluids throughout the body. This condition is often associated with inflammation of the tissues and joints, and can manifest itself in many ways including rheumatism and gout. Both lemon juice and essential lemon oil, properly diluted in water and taken internally, can combat acidosis by stimulating the production of potassium carbonate, a natural buffering agent which can help relieve pain and discomfort caused by the inflammatory response. The anti-inflammatory benefits of lemon may also help to keep levels of good and bad cholesterol in check and ward off the onset of coronary artery disease. Paisley Hansen is a freelance writer specializing in health and beauty. When she isn’t writing she can usually be found curling up to a good book. Paisley contributes to a number of communities to offer her advice. I’ve been recommending lemon as an Anti-inflammatory to my patients for years and most of them came back happily telling me it worked. No doubt the other tips also have some scientific basis. By the way, coconut oil is another similar thing. Good to know! Thanks for your comment doctor!